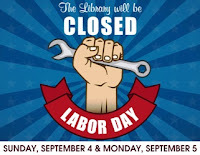 Roselle Public Library is closed Sunday and Monday, September 4 & 5, for Labor Day. We will re-open on Tuesday, September 6, at 9:30 a.m.
Roselle Public Library is always open at http://www.roselle.lib.il.us! Visit us online to check the catalog; review your account; renew things you have checked out, put things "on hold," and more. Browse the online resources to find out how to repair your car, research your family history, manage your portfolio, learn a new language, delve into Roselle's past, and more! Link to eMediaLibrary and eRead Illinois to download ebooks. And check out Freegal Music! Free music downloads and streaming! Visit us online and see what's available to you... even when the building is closed!